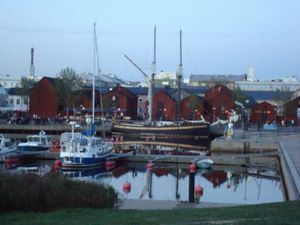 Oulu (Swedish: Uleåborg; ) is a city of 190,000 inhabitants in Oulu province, northern Finland. On 01.01.2009, the municipality of Ylikiiminki  was consolidated with the city of Oulu, increasing Oulu's land mass nearly quadruple-fold. As one of the results of the merger, Oulu is now officially an area where one might encounter reindeer. 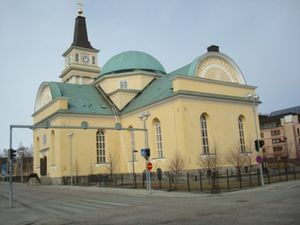 Oulu is the capital of the province of Oulu and the region of Northern Ostrobothnia. It is the sixth largest (fourth largest if you exclude Espoo and Vantaa) city in Finland, and the largest and most important in Northern Finland. 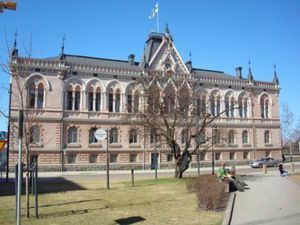 Oulu is known for its high-tech focus, with free wireless internet access, Panoulu , in the city center. A lot of Finnish IT companies, including Nokia, have offices in Oulu or nearby areas. Oulu Airport  is the busiest in the country after Helsinki, and the Helsinki-Oulu sector is the country's most popular domestic flight with frequent services (almost 20 flights per day each way) on Finnair and Norwegian. A fully flexible return economy ticket might cost more than €200 but a non-changeable one-way ticket can go as low as €20 or a return ticket for less than €50 when bought months in advance. Norwegian is often cheapest, but airlines compete on price for this route so be sure to check others. There are also some services to Riga, Rovaniemi, Tampere, Turku and Kemi. The terminal has recently been expanded and now has jet bridges to get you in the planes without having to walk in the freezing cold tarmac. The airport has an automatic map dispenser that provides free maps, but sometimes it doesn't work. Bus 9 (~€5) connects the airport to the city center in 30 minutes. Buses operate quite frequently from 06:25 to about 21:00 on weekdays. After 21:00 buses operate infrequently to 01:30. A taxi will cost you around €30 for the same distance. Oulu is on the railway main line between Helsinki and Rovaniemi. The fastest InterCity trains complete the journey from Oulu to Helsinki in less than 6 hours. Train tickets are significantly cheaper if booked in advance online and get more expensive as the departure date draws near. If you book your train ticket some weeks before the departure time, you might get them for as cheap as €25 per person. Tickets bought closer to departure cost up to €60. Direct sleepers take around 9 hours from Helsinki to Oulu (€64 plus optional sleeper at €12-€31 per bed). The newest type of sleeper train carriages have a shower and a toilet in each 2-person cabin. You might want to ask for the rather substantial discount that's available for e.g. students. Onnibus  offers low-cost long distance coach lines to Oulu from different cities of Finland. Public transportation is operated by Koskilinjat . Single ticket (kertalippu) in the city of Oulu costs €3.30 (€1.60 for children ages 4-11). Between 23:00-04:00 a single ticket costs €6.20. A single ticket allows one transfer within 60 minutes. A 24-hour ticket (matkailijalippu) allows unlimited use of the buses for the 24-hour period for €14.40 (€7.20 for children). To plan your route in the city, try Google Maps . It gives you the most convenient route to where you want to go, including walks to/from bus stops, which bus lines to use and where to switch buses. Bus drivers generally do not speak English, so plan your trip beforehand. To get a good look around Oulu, with English commentary, try Potnapekka . Half train, half bus, it operates during summer months (June to August) on two routes, via Nallikari or Hupisaaret, through roads for light traffic. Both routes leave from the stone ball at Rotuaari (at the center of Oulu) and the journey lasts about one hour. You can hop off and in on the way. Oulu is renowned for its good bicycle routes, which get you around the city easily and safely even through the cold winter. To rent a bicycle try Pyörä-Suvala, Lekatie 27. If you're staying at Nallikari Camping, Leiritie 10, they also have bikes to rent for visitors costing €12/day. Rotuaari, from the french word trottoir, meaning pedestrian street, is a place for live entertainment mainly during summertime, but also on weekends all year round. Part of the street has been renovated and refitted with heating in 2011, which should keep the street ice free even during the coldest winter months. Qstock  Rock Festival, late July. International Air Guitar Festival , beginning of August. Nallikari and its Eden sea resort. Summer visit is preferred, but you can bathe outside all year round in Eden's cozy temperature of +26°C. A bone-chilling dip in the freezing Oulu river can also be taken at the swimming spot (maauimala) of Tuira all year round. In the summer, either rent a bike or walk to the beach in Tuira on the north side of the river Oulujoki, a popular place with locals, passing through Ainola park on the way. From there head eastwards, crossing back to the south side of the river and onwards to Värttö. Visit Koivurannan kahvila in an old house by the river, Kasamintie 51. Then either ride or walk back to the center for a total of 8km trip or take the bus number 7 back to the center. Oulu is a place for eating pizza and other fast foods. For as low as €7-9 you can get a pizza with your choice of (usually three) toppings. Also there are many restaurants that have a pizza buffet for around €7-12 which includes a drink. Arguably, Finland's biggest pizzas are served in Oulu's Pizzeria Romeo. There is also the Pannu pizza joint in town - a bit more up-market pizzas for the discerning. Oulu is famous for pizza that is topped with mayonnaise after baking. During the summer months, head down to the marketplace and have some fried vendace (muikku) or salmon in one of the stands there. A number of restaurants serving international cuisine or fast food are found in Oulu, including Indian, Greek, Mediterranean, Russian, Spanish, Turkish, Thai and Chinese kitchens. For American style fast food there is McDonald's and Hesburger. For a more local burger experience, try Kauppuri 5 or Café Rooster, both renowed for their burgers. An interesting little restaurant is Pannukakkutalo Renesans near the market square, serving dutch style pannekoeken, or for the unfamiliar, crêpes. More than a hundred of either sweet or savory toppings to choose from. 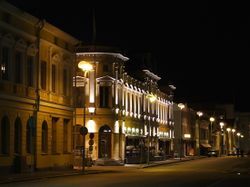 For typical, if a bit boring, french-scandinavian dining, hotel restaurants such as Sassi (Radisson SAS) and Fransmanni (at the recently-built Arina hotel in the town center) provide. For Finnish cuisine, head over the pedestrian bridge from the library to Pikisaari for Ravintola Sokeri-Jussi, offering traditional courses like Rössypottu (potatoes, blood and pork). Good experiences in a bit more upscale dining would be either Uleåborg or Puistola Dining, for a bit more affordable but still nice dining head near the Oulu Cathedral to Ravintola Hella. Ravintola Toripolliisi offers gastropub-style fare in nice surroundings both inside and outside, just in the corner of the marketplace. During the lunch time, usually from 11am to 15pm, most restaurants serves food for reasonable prices. Lunch restaurants and lists in Oulu can be found at lounaat.info. 45 Special, Saaristonkatu 12,. (08) 8811 845, Open every night. Weekdays gigs and meeting place of modern drunkards after 1.30am, weekends crowded. Amarillo, Kirkkokatu 15, (08) 312 3100, . Nice bar in the 1st floor and a night club underground. Also, the texmex-style kitchen is open Mon-Thu 11-00.30, Fri-Sat 11-23.30, Sun 12-23.00. Apollo Live Club, Torikatu 21-23, . A discotheque with two different rooms of different styles. Meatcounter for 20+. Wed,Fri,Sat 22-04.00. Caio, Sammonkatu 10, (08) 556 2286, Nice and quiet bar with music, billiards and food near the University of Oulu. Hevimesta, Torikatu 11, . Hard Rock / Metal club. 1e beer on mondays, wednesdays and thursdays til 1am. Kaarlenholvi/Jumpru, Kauppurienkatu 6, . Genuine Oulu. Pub downstairs with warmed up patio offers the authentic overview of locals. Nightclub upstairs attracts younger clientele and exchange students. Kuluma, Kauppurienkatu 5, 11am-2am. . If you fancy cocktails, this is the place to go. Some coctails include a fire-breathing display. Tivoli, Isokatu 35, . Four different rooms with different styles: Disco, Rock, Suomipop and "Saucepan". Meatcounter for 18 to 20 year olds. Sarkka, Hallituskatu 13-17. 9am-2am. You think you are pro? Come here at 9am and see if you have what it takes! Yöhuikka, Mäkelininkatu 13, Fri-Sat 11pm-4am. . A small gay friendly nightclub. Fresh decor, no entrance fee. Cloak room 2 €. Holiday Inn, Kirkkokatu 3, (08) 883 9111. Holiday Club Oulun Eden , Vellamontie 10, 020 1234 905. Spa hotel on Nallikari beach, a few kilometers (3.5km by foot, 5km by car) from the city center. Hotel Apollo , Asemakatu 31-33, (08) 5 2211. Hotel Cumulus , Kajaaninkatu 17, (08) 882 7111. Hotelli Forenom , Rautatienkatu 9, +35820 1983 415. In front of the railway station. Radisson SAS , Hallituskatu 1, (08) 8877 666. One of the best hotels in Oulu, a good choice if your budget isn't too limited. Scandic Oulu , Saaristonkatu 4, (08) 543 1000. Sokos Hotel Arina , Pakkahuoneenkatu 16 , (08) 312 3111. Pohto Hotel Kortteeri , Vellamontie 12, +358 10 843 4500. Oulu is on the whole a very safe city, but avoid getting into arguments late in the night in fast food joints. Some suburban areas like Kaukovainio and Meri-Toppila have a bad reputation and should be avoided at night time. The panOULU  (public access network OULU) network provides wireless broadband Internet access to everybody in its coverage area. The tourist information centre has a computer with free internet access. Hailuoto is the largest island in the Gulf of Bothnia and a good destination for day trip. Accessible by ferry, either with own car or by bus. Iso-Syöte is the closest destination for downhill skiing. Koskilinjat arranges day trips during winter season . Kuusamo is also a place to visit if you continue your journey to the north towards the Finnish Lapland. Koitelinkoski-rapids of Kiiminkijoki-river, about 25min by car from Oulu . This page was last edited on 28 October 2018, at 17:50.